We have barn cats ready to go for spring! Contact us to be matched with a crew of cats! 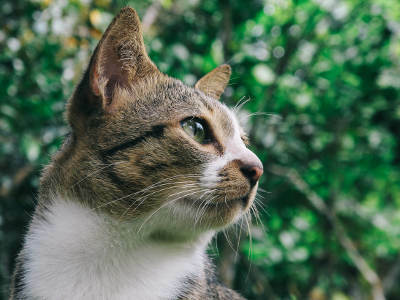 The CVAS Barn Cat Program matches shy cats that may not make good house pets with safe homes where their superior pest control talents will be appreciated! With barn cats on patrol, you can keep rodents under control without poisons or traps, while providing a home to a deserving animal. Barn cats are domestic animals that require care. While they do not require the same level of attention as a house pet, they do need someone to look out for them and help them if they become injured or sick. FOOD. Some people think that if a barn cat is fed, it won't hunt, but this is simply not true. Cats love to hunt rodents, and will do it instinctively. They also need to be provided with a nutritious cat food to keep them healthy and strong. WATER. Like all animals, barn cats need a readily available source of clean, fresh water. SHELTER. Barn cats need proper shelter such as a barn or shed to protect them from harsh weather and predators such as coyotes, raccoons and owls. Warm bedding material will also help keep your barn cats healthy and happy! Call (509) 684-1475 to let us know you are interested! When cats are available to re-home, we will set up an appointment to meet you and visit the property where the cats will be kept. The cats will need to be confined until they are used to the new location. It takes a few weeks for them to learn there is regular food and water available, so they will stay at their new home once they are released. They can be kept in an enclosed garage or outbuilding, or we can provide a temporary containment pen.